COMPASSIONATE CLIMATE ACTION: 34 Days - What Makes You Cry? Mr. Ecoweenie Man and his heartless conclusions aside, I would be interested (and touched) to hear from anyone else who cries about the global climate change emergency. If we don't feel it deeply, how can we be moved to action? It's hard to know why certain chords are struck as we read or watch the continuing bad news. My tears come from thoughts of what's happening to the children in Africa today, and what's going to happen to children in a climate-wracked future. 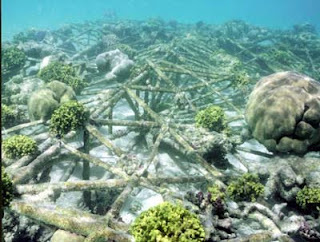 My husband weeps and rages at the loss of the world's coral reefs. I'm not sure why. He's not a scuba diver or a snorkeler. Perhaps it's their sheer beauty. Perhaps he knows that over one quarter of the world's marine fish species depend on coral reefs as their source of shelter and food. If you can't figure out what that means, join the club. The article goes on to say, "The prospects of saving the world's coral reefs now appear so bleak that plans are being made to freeze samples to preserve them for the future." So how is that for insanity? Spend two decades doing nothing, not calling for a climate change emergency declaration, NOT protecting the coral reefs — and then freeze them at the last minute? Are we criminally insane as a species? Have our scientists been watching too many whacked out sci-fi movies? According to Irreplaceable: Wildlife in a Warming World, coral reefs make up less than one percent of the marine environment, but are home to 25 percent of marine biodiversity. And according to the Worldwatch Institute's Oceans in Peril online quiz, over 100,000 coral reef species are already known, named and described, but there could be as many as one to three million — all now endangered. Do we not understand that we can't live without biodiversity? Thirty million people (the population of Canada is not much bigger) in the tropics and sub-tropics are small-scale fishers who depend on coral reefs for their livelihoods and daily sustenance. 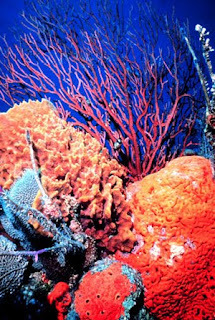 Coral reefs are a key source of food, income and coastal protection for half a billion people worldwide. It's certainly enough to make at least one grown man cry. Isn't it tragic that scientists can come up with plans to freeze coral (to "allow them to be reintroduced to the seas in the future if global temperatures can be stabilised") but we can't come up with plans to save coral reefs. Alas, I guess not enough people care — or cry. ADDENDUM: I just asked my husband why the coral reefs are so precious to him. "Back in the late 1980s," he said, "when we were starting to discuss this stuff, everyone knew that if the coral reefs went, the whole planet would go. Now, no one seems to care." The coral reefs are going, folks. Do we really want to lose the whole planet, too? Hi! Thanks for the post, it's sad, but a good lesson at the same time. Compassion as a solution to the climate change emergency? Of course, compassion towards the planet and all living things. Sadly, many of us are too self-involved to participate in any climate change actions. However, the more people get involved the stronger the chain reaction will be! Two things of late that made me cry: in the Earth documentary series, watching the polar bear almost drown and then die trying to kill a walrus out of desperation. And hearing Severn Cullis-Suzuki speak a few months back saying how she was hopeful in Rio, how she was hopeful at many stages in the last 20 years. But now she is more skeptical. I feel the same way, for every story of hope that you see, you find a similar story about increasing coal usage in China, or the renewed killing of Rhinos, or the fact that since 2000 when climate change was more or less an established fact that GHG emissions increased dramatically. Thanks to you both for taking the time to comment. I'm sitting in a city hotel at the moment, and for all the billboards and bus stop ads talking about renewable energy, the city is just as bustling with cars as ever. That dissonance can't be conducive to people feeling deeply about a danger that seems so far away to them. Remi, your heart is still intact if the drowning polar bear can make you cry. In fact, you're an excellent example of someone aligning his life's work with his values and beliefs — and it seems that you do it because you care, because you allow yourself to feel compassion for the plight of others. You touch on the concept of "compassion fatigue," but I don't get the impression that that's a problem for too many people. The problem seems to be a culturally stunted ability to feel compassion. Perhaps it's a learned ability (rather than innate? ), and we're just not doing a good job of teaching it anymore. Something to think about.